Magnetic Dinosaurs 20 Pieces are a carton full to the brim with prehistoric fun. 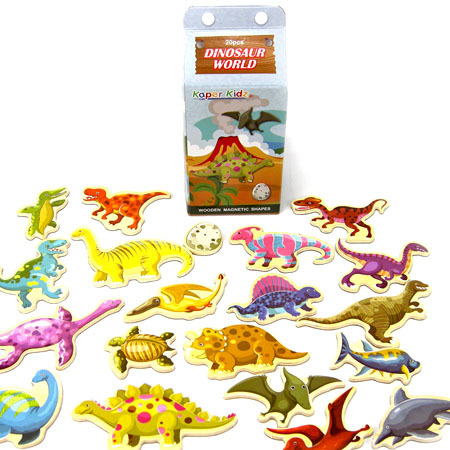 This set of 20 colourful dinosaurs are made of wood and have a thin magnetic layer bonded to the back covering the whole shape so there are no small magnets to fall off. The packaging for these dinosaurs is a resealable milk carton so packing up and storage is a breeze. Perfect for use on a fridge or whiteboard and wonderful for the dinosaur obsessive in your home. Material: Wood childsafe paint, magnetic sheet, cardboard carton. We like this because: "A lot of dinosaurs in a milk carton.. what's is not to like. "